On Thursday evening, August 18th, 30 lucky friends of Slow Food Corvallis enjoyed the privilege of a free visit to the USDA National Clonal Germplasm Repository at OSU’s Lewis Brown Farm. There, pear collection curator Joseph Postman guided us through the collection, which features over 1000 pear varieties from 53 countries. The mid-Willamette Valley provides an ideal location for this facility due to cool temperatures during bloom periods followed by dry summers. We began the tour by tasting several varieties in the shade of the trees near the lab. Then, as we walked through the orchard, Joseph showed the participants a surprising number of pear varieties of which a surprising number were ripe. 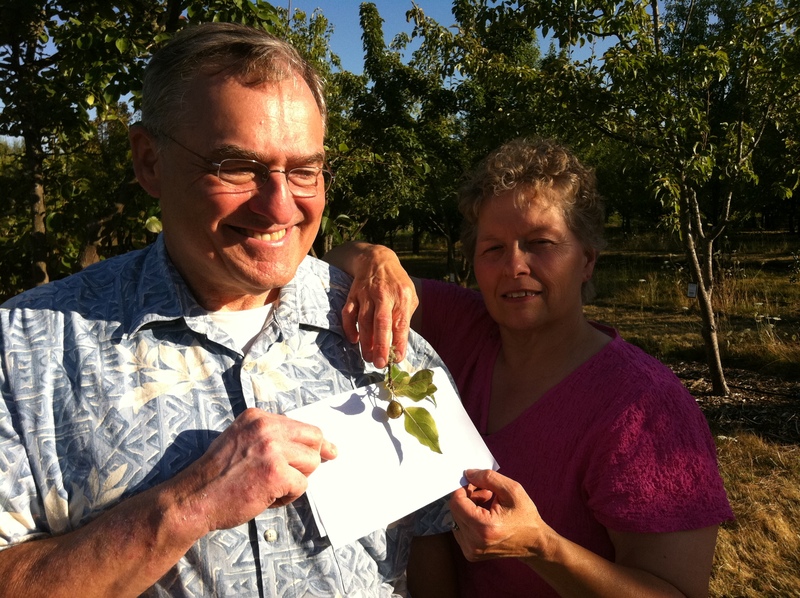 Dr. Postman explained how pear breeding and grafting are used to preserve biodiversity. Participants then walked back to the lawn of the main building by to enjoy samples of tasty pear dishes provided by Slow Food Corvallis volunteers. The tour was free, and participants donated $5 each for the desserts, with proceeds going to Slow Food’s food education activities. The tour was organized by active Slow Food member-supporters David and Linda Zielinski. We were surprised to learn that David’s father had been instrumental in starting the collection, by bringing genetic material from Eastern Europe back in the 1950s. Many thanks to David and Linda for organizing, to Joseph Postman for sharing his knowledge, and to the Slow Food Board members who brought pear crumble, chutney, salsa, poached pears, salad, and other delicacies featuring several varieties of pear.